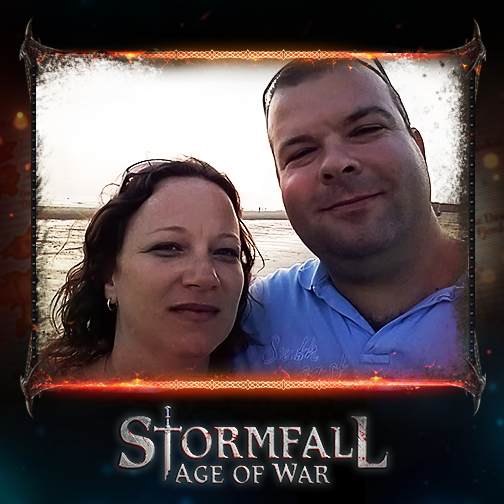 Amy Lynn Lievense, the founder of the Azeroth League, tells us how she found love in Stormfall. 1. 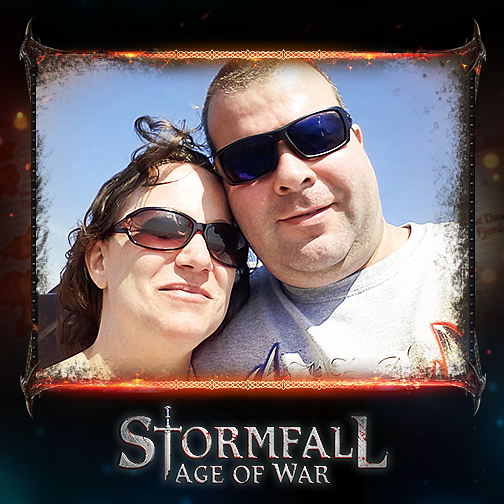 How long have the two of you been playing Stormfall? We both started the game in January 2013. I left the League I was in and started my own, called Azeroth. I needed Resources to develop and found myself a nice little Castle to farm not far from my own. At this point my League was young and I wasn’t worried about who I would raid and any possible retaliation that might result. This one Castle I was farming was always rebuilding and training more Units that I had to then go and kill. My League needed new members to grow. So after this had been going on for a couple of weeks I wrote the Lord of this Castle a letter with an offer he couldn’t refuse: join or die. This Castle’s Lord was Dennis, aka “Wolve”. Well, turns out he was quite a nice guy. After he joined I spent time watching him in the chat and he quickly sparked my curiosity. We became Facebook friends and started talking and he quickly became my best friend. I learned he lived in The Netherlands, aka “the other side of the moon” from where I lived in Texas. The distance between us was exactly 5,000 miles and the time difference was seven hours. After talking for a couple of months, we knew about most of each other’s lives and found out we had a lot in common. We skyped every single day in the morning before he went to work and from the time he came home until I had to go to work. On the weekends we would have skype sessions that would last over 12 hours. He told me one day that he would fly over to come see me. While this was a nice thought, I didn’t think he would ever actually make such a long trip. Well, to my surprise he did. He came to see me on his birthday in October of that year. When we finally met at the airport I felt like I had known him my whole life. It was like a dream come true, except it was even better than I could have imagined. To top it off, he fit right in with my crazy family. He returned to visit me in the Spring of 2014, then in the summer of 2014 I went to visit him and his family in Holland. We planned a trip to Holland the next year so our kids could meet one another for the first time. Our Stormfall friends from all over the world were so excited that some of them even contributed towards making this happen. We flew back and forth like this until he got approval from the US Government to move to the US. Finally the day came when we would be together. On July 15th, 2016 he landed at Bush International Airport so we could spend the rest of our lives together. We got married that September. A couple of months after he joined the League he became my first Captain and he helped build the League up to what it is now. I would handle external affairs while he took care of internal affairs. Nowadays we have a whole team of people who help run the League. 3. What do you enjoy the most about the game? Well, I have to say that we most enjoy the wonderful people from all over the world that we have had the privilege to meet. Some have become like family to us. They will always be in our hearts and thoughts. 4. How does your League operate? We have been running the League together from shortly after he joined and the most important things always pass by one of us. We’ve planned Beacon takeovers, Fortress takedowns, and much more than that together. Of course, this usually takes place with the help of our team. Most times we discuss important matters before we throw it out into the group.